The hunt will begin at 12:00 p.m. for the first week and 10:00 a.m. for the rest of the season. If you are an early riser, feel free to grab some fresh coffee, watch some t.v., or get your dog ready for the day. Sometimes the hunts last all day and sometimes they only last a couple hours, depending on how the birds are and mainly on how the shooters are. 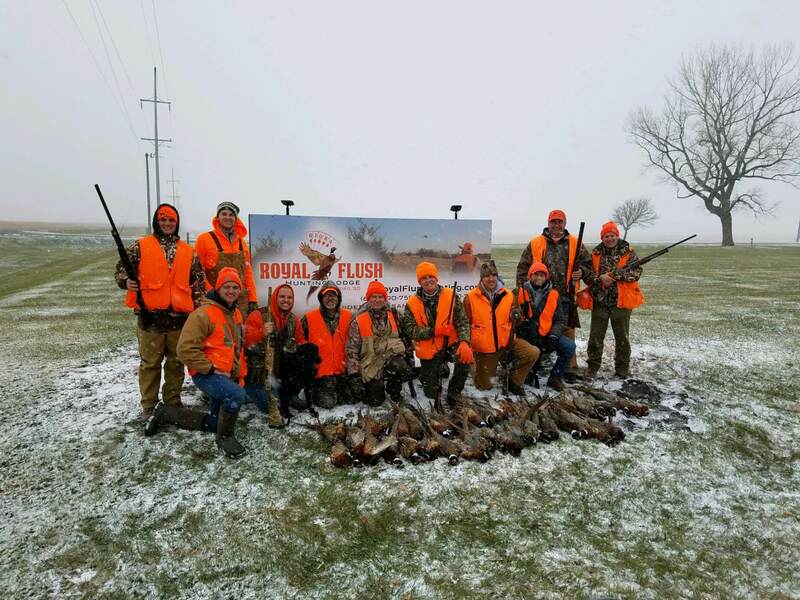 For groups with 5 or less hunters, we may combine them together depending on the availability. With over 4,000 acres, there is plenty of land to make sure that there is a different type of hunt every day. Please remember that you are coming here to hunt, so we can not guarantee you will get your limit every day. All of this will depend on many factors such as the weather, the dogs, the pheasants, and obviously how well the hunters can shoot. Hunting in Aberdeen, South Dakota in the fall and winter will bring various conditions, so be prepared to dress for rain, snow, or shine. When the hunt is over for the day, feel free to take a warm shower and get ready for the evening…we will take care of the birds for you. After a long day of hunting, some people like to just lay around and relax while others want to keep the fun going. Check out the lodge and see what all there is to do! All hunters are required to wear the proper hunting clothing. Please check out our what to bring section to ensure that the hunt will be a fun and memorable experience. Pheasant season in South Dakota runs from the middle of October to the end of March. 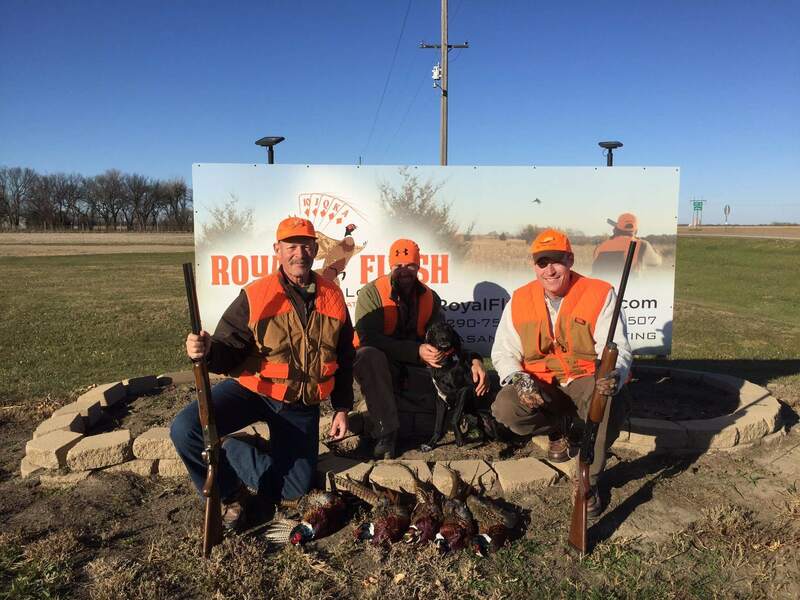 Ready to book a South Dakota Pheasant Hunt? Do not miss out on a hunt of a lifetime! Early Season: Oct to end of Dec. This part of the season is a perfect time to work out the kinks and get a good feel for how the pheasants are here in South Dakota. The temperatures normally range from the 30s on up to the 70s. It tends to get a little warm while hunting in the field so make sure to bring some water. Birds during this time of season are young and haven’t been shot at much so they are typically a little bit easier to shoot. Normally there is not too much snow to speak of which makes the hunts a little bit easier. Plan on wearing lighter clothes and waterproof boots. For new hunters in the family, this would be the perfect time to sharpen their skills and learn the process. Late Season: Jan to end of March. This is the part of the season that brings out the hunters who like more of a challenge and don’t mind doing a little work. Temperatures are normally pretty cold anywhere from the 40s down to below zero which allows for more snow. The birds are more mature, bunch up together and have been shot at so they are a little bit smarter this time of year. It’s fun and it’s a challenge! Plan on layering up to keep the toes and fingers warm. Corporate Hunts: Planning a corporate retreat or even a 1 day hunt? We would love to help treat your corporation to some amazing hunts. Whether it is just to get away from the hustle and bustle or to celebrate a great year, we have plenty of ways to accommodate your needs. The staff is friendly and the food is amazing! Meetings — For the businesses that need to have important meetings, we are more than happy to accommodate you. There is plenty of room in the lounge/game room with a big screen that can be connected to your computers. We also offer high speed internet to help you keep up to date with any type of information needed. Entertainment — Here at the lodge we want you to enjoy yourself and enjoy the reason you came here…to relax and have fun. We have things to do such as playing pool, ping pong, darts, cards, and listening to music. Or just relax by the fireplace and watch the game! Day Hunts: This is primarily designed for people within driving distance of the lodge. Whether you want to bring your company out for a quick “business meeting” or have some family that you want to treat, come see us. There is nothing better than hunting pheasants behind some amazing dogs! We will take care of the birds for you while you enjoy the moments with friends, family, or co-workers. Don't miss out on a hunt of a lifetime! 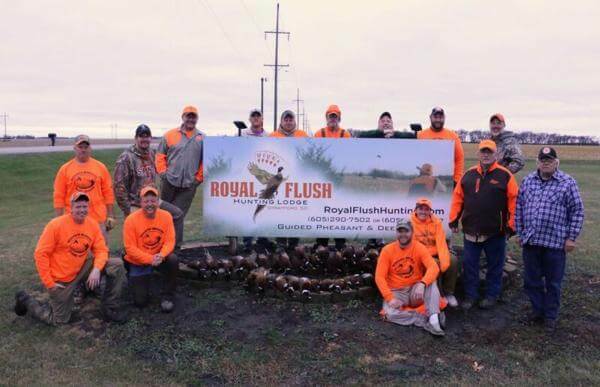 Book a South Dakota Pheasant Hunt. Safety among everything else should be everybody’s most important factor in the hunt. Hunters are encouraged to check out the South Dakota Game and Fish website for current rules, regulations and safety precautions. Alcohol is only permitted after the hunt is over. No alcohol will be allowed before or during the hunt. All hunters will be required to sign a release of liability prior to hunting. Hunters are required to wear orange at all times while out in the fields. A list of required and recommended items to bring/wear is found in our what to bring section. Hunters that blatantly disregard the safety of other hunters, guides, or dogs will be asked to leave immediately. We want hunters to come and enjoy their hunt, but more importantly we want them to return home safely! A 50% deposit is required to reserve your preferred hunting dates. The rest of the deposit needs to be paid upon arrival or prior to. Reserve your dates early! Spaces fill up very quickly. Deposits are non-refundable, however you may be allowed to switch your dates around providing that there are openings. Sorry, but the dates have to stay within the same hunting season. If you have any concerns at all, please feel free to call us and we will do what we can to accommodate you. It is highly recommended to purchase travel insurance, just because things happen.